We were in Arkansas this past week visiting my daughter who has chickens, and I had forgotten how funny chickens are to watch. 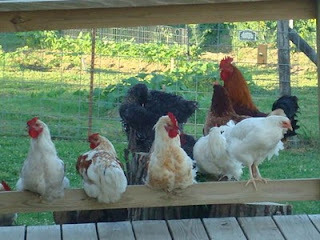 A duck came around the hens, and the rooster was about half a block away. Wait, farm land isn't measured in blocks--but you get the idea. The rooster high-tailed it to scare the duck away from the hens. I was surprised at how protective he was. Back to chicken potholders and sewing. 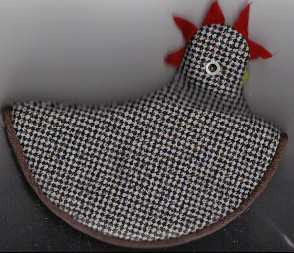 We have some chickens in the kitchen at our house--in the form of potholders. They aren't as fun to watch as the live ones, but they are fun to make and a serve a great purpose if you cook much. These potholders can be made of any fabric that isn't very flammable and that doesn't melt in a little heat. We use felt for the comb, and sometimes use a pre-quilted fabric to make these fast. Here's one I have been using--since the eye is in the wrong place. These hotpads are made of three basic pieces--the sides, the bottom, and the comb. This is fun crafts sewing and it won't take long to make a couple for your kitchen. If you are creative, you can make a rooster, too. We named the funny protective rooster Roo, or maybe that was Rue. See you soon with more crafts and stitching fun. 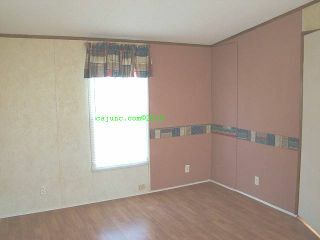 Valances can work for window treatments with blinds, and we made some for a mobile home we were preparing for sale. I promised photos a couple of blogs back, and finally got one for you to see. There are some real advantages to making valances instead of curtains or drapes, since they take much less fabric and allow more outside lighting into the room. Be sure to prepare the fabric so the valances or curtains will hang nicely, as this is a key to getting the look right. The chair rail or wainscoting is fabric, too, covering a strip of Masonite. We used Aleene's fabric glue on the backside only to attach the fabric to the board, then attached the chair rail to the wall with a mastic product. 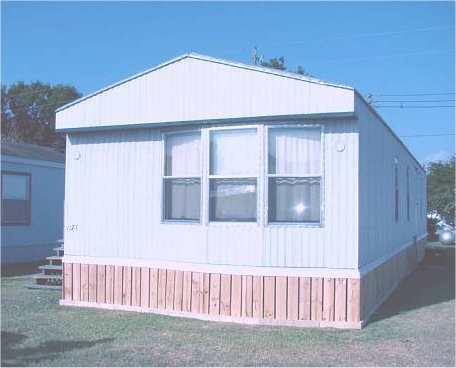 With no furniture in place, this looks bare, but fabric and crafts in a mobile home give it some personality and a style Once the furniture is in place, this will pull together. Curtains and valances are easy to make, and even purchased curtains and drapes usually have to be re-sized for a mobile home, since windows never seem to be a standard size. Here's how the fabric looks with the light colors on the other side. We hope this is inspiration for your home decorating and sewing projects. See you soon with more needlework crafts sewing and stitching fun. Saturday morning always reminds me of garage sales, and yes, I love them. There are more unused crafts projects, fabrics, patterns, and crafts supplies than most of us can use in a lifetime. Crafts are also available at thrift stores and resale shops, flea markets and collectibles malls. There are also some supplies available at craft fairs and shows. Look for crafting material wherever you are, and wherever you go, and become a hoarder. Well, maybe not a hoarder like they show on the program, but collect some crafts supplies for your projects. With the cost of good thread for sewing projects, I have decided to watch for thread at estate sales, and it is surprising how much thread is available by the bag. I now have all the colors of the rainbow, and most of the ones in between, even ones that are invisible to the old lady eyes. Crafts can be expensive projects if all your purchases come from the local crafts store. Get into frugal living and recycle by buying crafting materials on the secondary market. You don't need to do it to the extent I do, but do it on a small scale, save the crafting materials for your next projects. Here are some tips. Think sewing, crafting, stitching fun anywhere you are. If the items are new and look like they would make crafts, buy them for later. 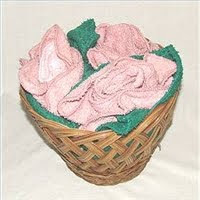 This is how I got about 40 washcloths and made roses in baskets. You probably saw the flower basket instructions way back in this blog, and we did poinsettia flower basket instructions, too. Baskets are everywhere, too. I buy some baskets with the tags still on--never used--and they are great for storage of crafts until you need one for a project. If you need special lace or fabric, look in the used clothing. There are new or nearly-new clothes with expensive lace and fabrics just perfect for trim. Buy all accessories like tape, straight pins, safety pins for quilting, rulers, and backing fabric. These products are in abundance at flea markets and other secondary market selling spots. Use purchases from the secondary markets and save money as well as the environment. We're just about done working on the mobile home, and the latest sewing project has been some valances for the bedroom that has blinds.Valances can be in many designs, but the ones that are just straight across are easy to make. They need to be twelve to fourteen inches in length, and the measurements are calculated just like drapes. If you are interested in saving energy, valances are not energy-saving. Start with the size you want--about 12 inches--and add the ten inches we discussed in the last blog. 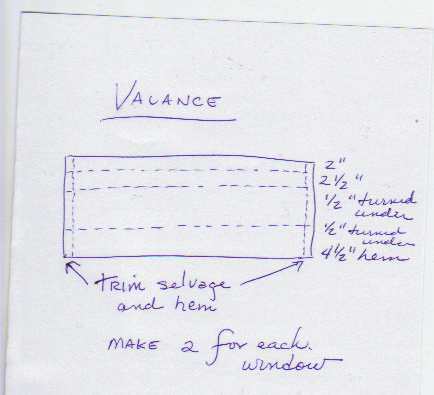 Make sure the fabric is straight before you start the valance measurements. The length before sewing should be 22 inches or even as much as 24 inches, and the width should be at least twice the window width. The windows I am working with are 23 inches wide by 63 in length--but the length does not matter for a valance, except to make the look proportional. A very long window may need a slightly longer valance, and a short squatty window can use a shorter valance. 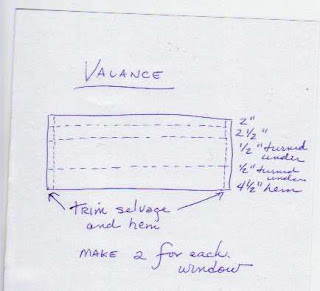 The valance should cover about a fifth of the window when completed, so a sixty-inch window needs about a 12-inch valance. 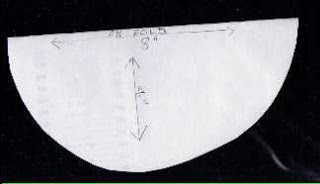 With the addition of ten inches for hem and rod pocket, you will have about 22 inches, and I use the total width of the fabric. This fabric is 45 inches, and for extra fullness, I want to sew two valances for each window. Once you have the valance cut at about 22 or 24 inches, take a look at the selvage edges--the factory finished edge may be wrinkled or puffy. I usually trim these edges for curtains or drapes, so the fabric will not be puckered or so they will hang without any pull on the sides. Once the edges are trimmed, turn under about half an inch, then about 5/8 inch and press with the iron. Stitch each side with a seam and make sure it is not puckered. Then, press the valance with five inches folded over at the top, and five inches folded over at the bottom, like we discussed in the last blog for curtains and drapes. Turn under half an inch for the raw edges on each end and press. Stitch across the top at two inches down, and close to the turned-under edge. This forms the rod pocket, with a two-inch ruffle at the top. Make sure you have turned under the raw edge on the bottom, and sew the hem at 4 and a half inches. C'est tout! as the Cajuns say--that's all--it's that easy! Mobile home curtains and drapes never seem to be standard size, and the easiest way to get new curtains or drapes for a mobile home is to make them yourself. 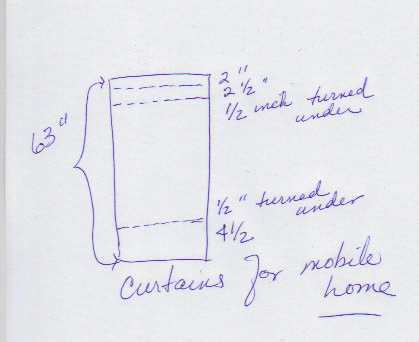 We are getting a mobile home ready for sale, so I have been making mobile home curtains this week. The first set I completed was a new set in the package from a thrift store. They were originally 84 inches, but the mobile home windows are about 32 inches wide and need about 63 inches for the length. An ample hem for curtains or drapes is usually 4 to 5 inches, so I cut these curtains at the bottom at 68 inches, folded under half an inch, and made a 4 1/2 inch hem. The scraps will make a pillow, since they are nearly 20 inches and the total width of the curtains. Do not be restricted by the size of the scraps, but use creativity to put together a pillow or two. If you need, select a center that is another fabric in about eight or ten-inch size, and just add strips of the curtain fabric around the square or rectangle. Drapery fabric is always the best choice for curtains, since it has some sun-fading resistance, and is usually heavier than dress fabric. 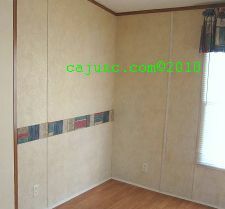 I had some drapery fabric that is lightweight but durable, and had enough for three curtain panels for the mobile home. Since I needed 63 inches completed length, I measured 73 inches for the curtains. The ten-inch added length is easy to remember and works well for most of the mobile home drapes and curtains. So, cut the fabric into 73 inch lengths (or whatever length you need, plus ten inches). 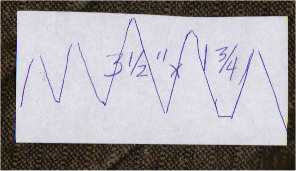 Here is the "pattern" to see how ten inches works. With this pattern, you can make any length curtain needed. Make the width double the window width or more for fullness, and the full width of the fabric is fine. Just add ten inches to the needed size, and press five inches at the top and five inches at the bottom. When sewing the top, the first two inches creates a ruffle, the 2 1/2 inches makes the rod pocket, and the last half inch is folded under. Remember to use scraps for pillows for the room when working with the living room or bedrooms, or use the fabric to cover a chair rail to attach to the wall. See you soon with more needlework crafts sewing and stitching fun.